After a boom, usually boom towns end up a shell of what they were at the peak of the boom, and maybe even abandoned. In contrast, poker has followed its boom with a very high plateau of continuing interest... despite all sorts of business missteps, scummy activities, and a transition from entrepreneurialism to corporate-think behavior. 1) the two real money online poker rooms combined at peak times to have about 2200 real money players, including sit-n-gos (2000 or so players at Paradise Poker and 200 more at Planet Poker). Peak ring game player numbers today according to PokerScout are over 55,000... and this doesn't include the many thousands more playing sit-n-gos, and the many thousands more on top of that playing multi-table tournaments (which didn't exist in 2001). 2) the universe of German tournament players could be literally counted on one hand. Today you can't shake a bush without a bunch of German tournament players falling out. 3) the tournament poker circuit almost always consisted of only one tournament series going on somewhere in the world at any given time. As I type this, there are major events underway in California, New Jersey, Mississippi, Florida, Australia, England, Macau, Vietnam and Morocco, as well as a couple dozen smaller events. 4) the vast majority of regular poker players congregated in California, Nevada, New Jersey/New York/Connecticut and Mississippi, plus more in the UK, Canada, Australia and France... with over half of all live casino poker games taking place in California on any given non-WSOP day. Today, poker is almost everywhere. Russia and Germany now alone combine to have a ballpark number of regular players similar to the entire 2001 universe. 5) in January 2004, nine months after the boom started, Nevada had 408 poker tables operating in the state. That number reached 905 in May 2006 and peaked at 1002 in June 2010. At the beginning of 2018, that number has fallen to just under 600... but that still represents a 50% increase over the number in existence during the most frenzied months of the boom. 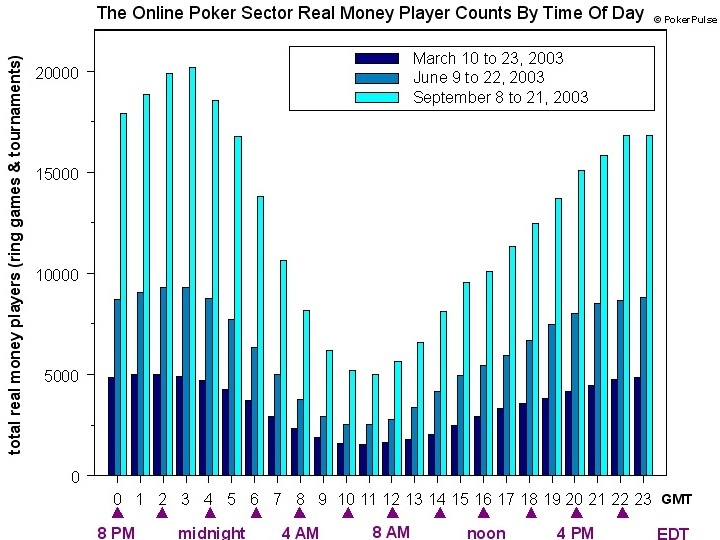 6) the graph at right, from PokerPulse.com (PokerScout didn't exist yet) shows the growth of real money players between March 2003 (the first WPT broadcast was March 30th and Moneymaker won the WSOP in mid-May) and September, plus also the June timeframe. Peak real money players went from around 5000 in March to about 20,000 in September. Again, compare that to the much higher player numbers every month these days. Yes, these days there are less 22-year-olds who think they can win a yacht in three months by bluffing 7♠5♥ than there were in 2008. But, anyone whining that poker is dead has no perspective. While US government action in 2011 drastically hurt poker game action and poker businesses all over the world, the game has boomed and diversified far beyond one country's shores. European, Asian-Pacific and Western Hemisphere poker action is in abundance, as are online games. The reason for this is because: people love to play poker. They just don't necessarily want to play for ill-advised high stakes that are dull as games, even if potentially exciting due to the money involved. What there is less of is the kind of feverish, out-of-control action that happens when anything booms, whether that boom is gold or silver or Beanie Babies. When the Alaska Gold Rush busted, Skagway went from 30,000 people to under 1000. After the Comstock Lode petered out, Virginia City lost 90% of its population. In contrast, the poker world is something like 50 times bigger than it was before the boom began. There still are a significant number of players who will play for a much larger portion of their bankroll than is sensible, and while such folks might draw a lot of the attention, the vast bulk of poker action in casinos and online occurs at much more mundane levels, where money won and lost neither cripples a player nor will get them a new yacht every month. If your only point of reference is the Mount Everest peak of things, anything else may disappoint you. 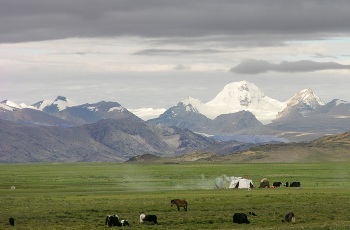 But if you take a moment to realize the Tibetan Plateau is a vast expanse three miles above sea level, you might gain a better perspective on how impressive a feat it was to get there from where you started.